Preheat oven to 400 degrees. Thoroughly wash and dry sweet potatoes, then slice into bite-sized pieces. Add the sweet potatoes, chickpeas, olive oil, thyme, cinnamon, himalayan salt, cumin, smoked paprika, ground coriander and cardamom to a bowl. Toss to coat and arrange in a single layer on a baking sheet. Bake for about 30-35 minutes, tossing at the 15-minute mark to ensure even cooking. Remove the tops and the roots of the beets and peel each one with a vegetable peeler. Cut the beets into matchsticks. Place the cut beets on a baking sheet and toss with the olive oil, salt + pepper. Roast for about 20 minutes until the beets are tender. Mix the almond flour, tapioca flour, coconut milk and salt together. Heat a nonstick pan over medium heat, add ghee and pour batter to desired thickness. Cook until the batter fluffs up and looks firm. Then flip over to cook the other side. Add all sauce ingredients, except almond milk, to a mixing bowl and whisk to combine. Gradually add almond milk to thin. Place the onions into a pan. Add oil or ghee and a generous pinch of salt. Cook onions over a medium heat for a few minutes until fragrant and softened. Make sure to stir frequently to avoid sticking. Add a bit more oil if necessary. To assemble, slightly warm wraps if preferred. 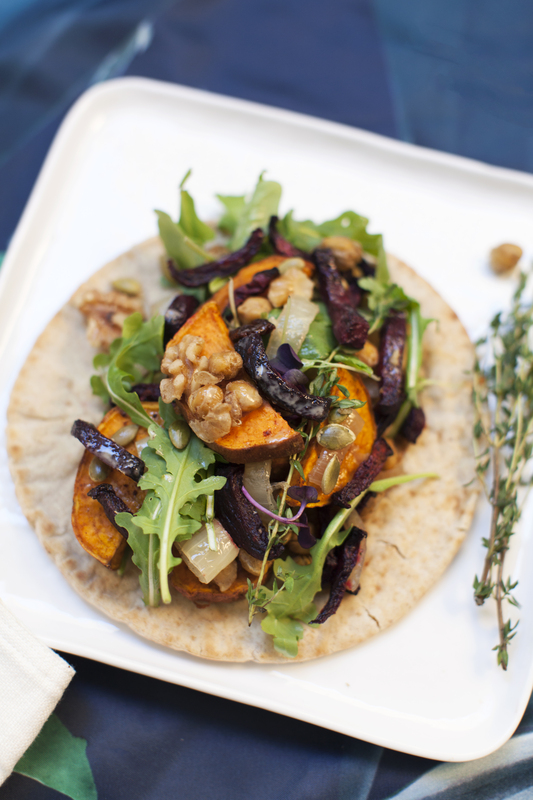 Top each wrap with a portion of sweet potatoes, chickpeas caramelized onions and beets. Sprinkle with goji berries, walnuts and a generous handful of arugula. Drizzle with garlic tahini sauce. Dive right in!